More than 75 houses were damaged when violent wind hit northeastern part of Mizoram bordering Assam on Monday morning. Sources said that more than 8 dwelling houses were destroyed by the violent wind at Saiphai, a village adjacent to Saipum near Assam boundary. 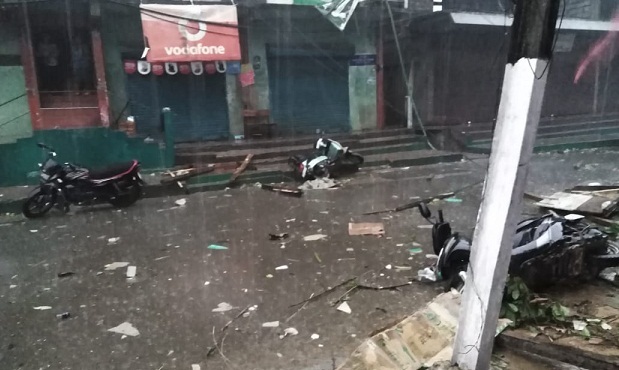 Meanwhile, the C&RD blocks of Resubelpara and Bajengdoba in North Garo Hills (NGH) district of Meghalaya were also hit by a storm that hit the area in the early morning on Monday leading to many houses being damaged with some being completely blown away. According to district officials, villages like Resubelpara, Sualmari and Jonglapara among others were hit in both Resubelpara and Bajengdoba blocks with officials concerned are now making an assessment of the damages caused by the storm. People hit by the storm are currently being given shelter in various locations on a temporary basis with the administration working to ensure food and accommodation to all that have been affected. On the other hand, windstorm and lightning claimed lives of three women in Manipur while more than a dozen people including students were injured on Monday morning. Windstorm rendered several people homeless after their houses were destroyed. The windstorm mainly hit three districts of Manipur including Bishnupur, Kakching and Churachandpur, official sources said.